The two prompt words for this week’s Challenge are “oblivion” and “morning glory“. I have chosen “morning glory“. 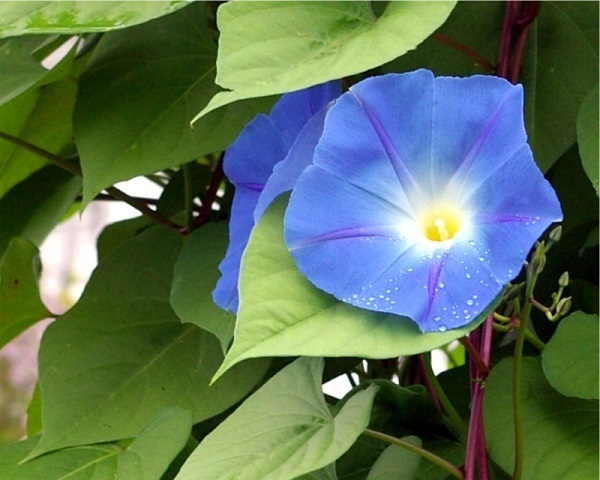 Just as sunshine spreads over early morning horizons, beautiful trumpet-shaped blossoms of morning-glory vines burst open, pollinated by early rising birds and industrious insects. By late afternoon the morning-glory blossoms fade and die, new flowers appearing on the ‘morrow. There seems a special magic to the hard working morning-glory. Their entwining vines hardy in dry earth and lovely blossoms giving forth rich mixtures of greenery and various hues of colored flowers. The morning-glory flower makes the most of its day, for one day is all it has. To me a specialness in this. A point nature is making here. Will I make the most of my “lifetime’s day” on this planet? Will I enthuse a richness in my manner of being? Can I be hardy as the vines, even on the toughest of days? Will there be a fullness of beauty, an openness of expression in the sharing myself with others, so they too may share and so on? Yes, I can do this. I shall be as the “morning-glory” in my human life! Congratulations! And to all who entered, the quality of your written haibun is so good that selecting honorable mentions has become very difficult. This also means I am really looking forward to reading and sharing each of your new creative haibun in the coming weeks. And please don’t forget to check out the two other co-hosts of the Ligo Haibun: Nightlake and Managua! 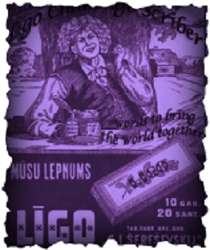 join us – become a haibuner! Write your own original haibun – a few paragraphs (prose) based on your thoughts, experience, or take, from one of the two prompts given (“oblivion” or “morning glory”), include a haiku (short free verse poem – such as the one above – that imbues the essence of your written piece (the several paragraphs). For more information click on the Haibun Challenge section at the top of this page. Enter your written piece, after publishing it on your blog, by clicking on the little blue box and following the directions! ← Attitude is not a Platitude … It’s a choice! Your story of the morning glory particularly touched me Penny. 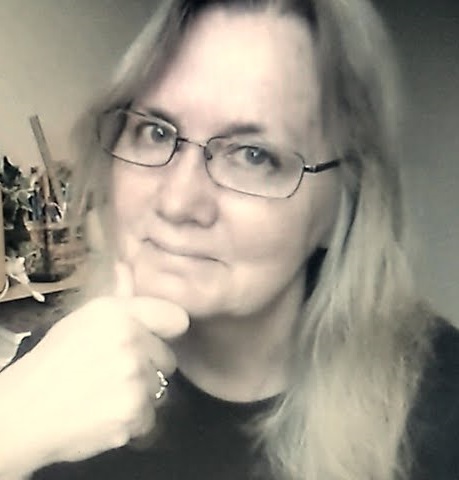 Before my dear friend Barbara passed away, with the help of a friend, she completed a short video, taping the morning glories in her yard that were still hanging on at the end of their season. She felt this was an analogy for her live, still holding on but wondering when it was time to let go. It was so moving and something she left for us to share during her memorial service. She allowed me a private viewing before she passed. I will always have this touching memory. It certainly was. Barb left some gems behind to help family and friends heal. She sounds so wonderful LuAnn! Truly! Each day, give to recieve. Wise Morning Glory. Loved the haiku, Penny. One day of glory being all days. Many layers of meaning here. Nicely done! Superb analogy – and worth really thinking about it. Your writing does the same, it just blooms-though I do secretly think you could make ironing a gracious art with your words. 2nd sentence in 3rd paragraph might need looking at…well done penny! Penny, nice evocation of this short-lived flower! Still – I do really try to live each day to the fullest. Some days are easier than others as some days are better than others. But – I try. Thoughtful and thought provoking haibun. And honored to see my name up there. Most deserving too Eric, I might add!!! (your name in the honorable mentions, not my haibun, lol! Thank you all for the encouragement and appreciation. Congrats to all who write haibun! 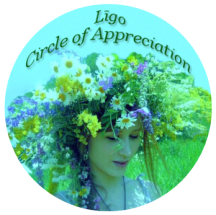 Maybe I should mention it now, that the “pretty” ligo circle of appreciation badge I apparently stole to display on my blog’s sidebar, is actually legit now. 😉 I’m officially in the circle of appreciation. Thank you all for not asking me to turn in my badge earlier. I snagged it purely for its prettiness! Thanks for absolution…and, more seriously, for helping me find my way with haibun, Penny. You’re welcome Angie, I am very pleased to have been of some assistance, although you have a natural way with words. A talent all your own that does lend itself well to the haibun style.